RALEIGH — State leaders are moving fast on a sweeping new transportation spending formula that will make it easier to find money for strategically important highway and freight railroad projects – and almost impossible to find money for passenger trains, sidewalks, bicycles and regional transit. Gov. Pat McCrory has the opportunity to chart a new course for North Carolina. With Republicans in full control of the House of Representatives and the Senate, there is much from his agenda that he can accomplish. There are also initiatives he can accomplish and promises he can keep without their help. ARE TOLL ADVOCATES DISTORTING THE TRUTH? There is a growing debate in North Carolina about who should pay for certain transportation facilities. Downeast the issue is focused on ferries. Should the existing ferries be supported by gasoline taxes or should those who use the ferries pay higher tolls? FOR WHOM WILL THE BELL TOLL? What's this about Republicans trying to raise taxes, ah, make that tolls? North Carolina lawmakers continue to nibble around the edges of a major funding issue that begs for an extended discussion and a tough solution: How should the state pay for highway maintenance? THE QUESTION: WHO PAYS FOR I-95 WORK? This article is about tolling Interstate 95 from South Carolina to Virginia. I-95 tolling is not a new topic as it was under heavy discussion long before I left the General Assembly in 2010. There is no one perfect solution to the issue. Yet something must be done. Doing nothing and allowing I-95 to remain a four-lane interstate is not a real option, therefore I will not discuss that any further. A piece of legislation that would prohibit tolling of existing Interstate lanes in North Carolina is halfway to the governor’s desk, as the state’s House of Representatives passed the bill 108-7 earlier this week. 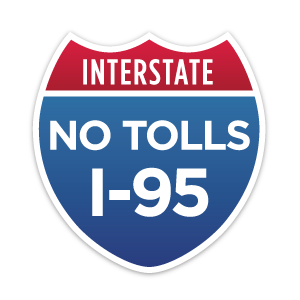 Lawmakers in the North Carolina House have voted to allow tolls for I-95, but only for any new lanes that are built.